Le Meridien Saigon is one of Ho Chi Minh City’s most ultra-modern 5-star hotels. 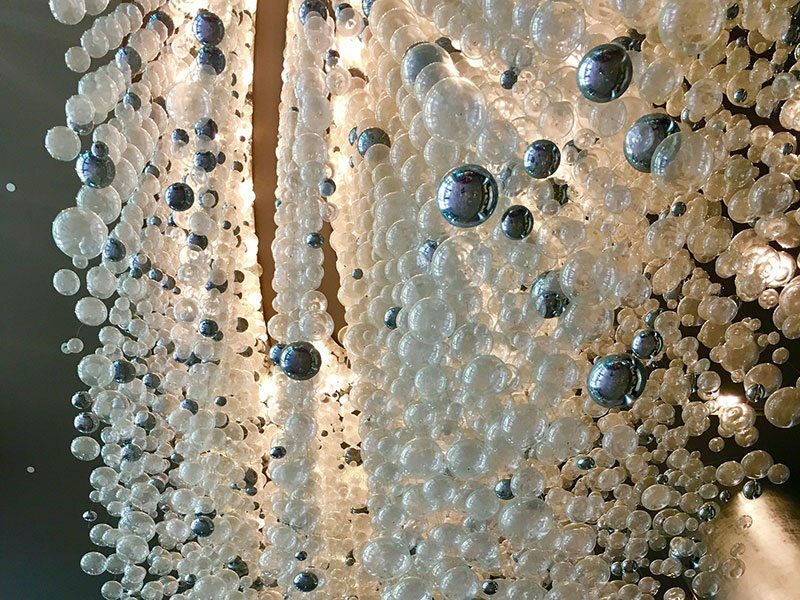 If you like bright and shiny things, you will love this hotel. 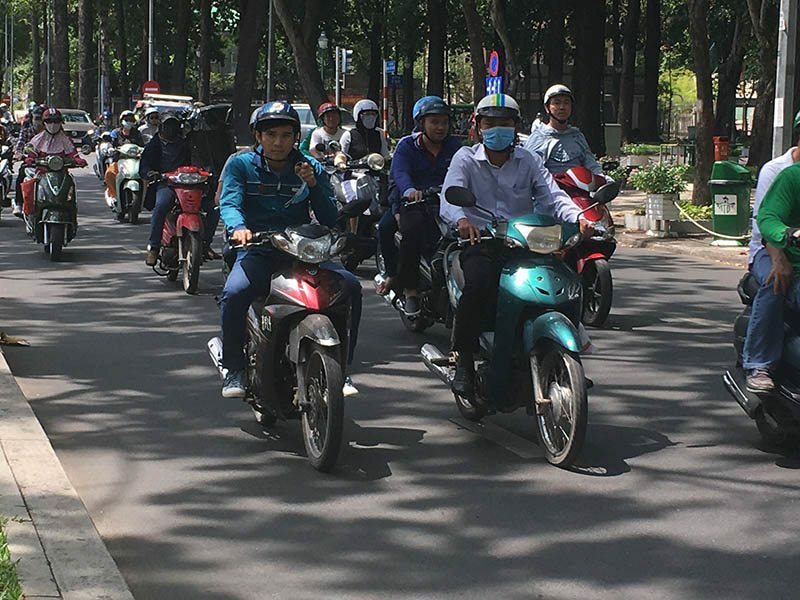 It is located across from the shipping dry dock on the Saigon River, and the crazy relentless motorbike traffic of this very appealing city races past the hotel, not to mention the construction that will one day make this area are pre-eminent location. 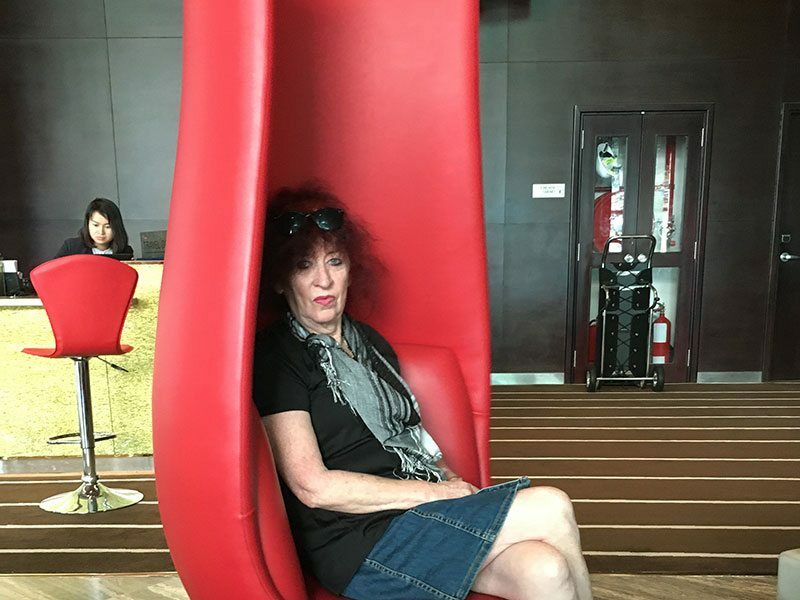 It is this juxtaposition that makes the hotel so unique. We have previously stayed at Le Meridien Jimbaran Bay in Bali, and know that the signature of this hotel group is their art and design, closely followed by their attention to food. This was certainly the case at Le Meridien Saigon. 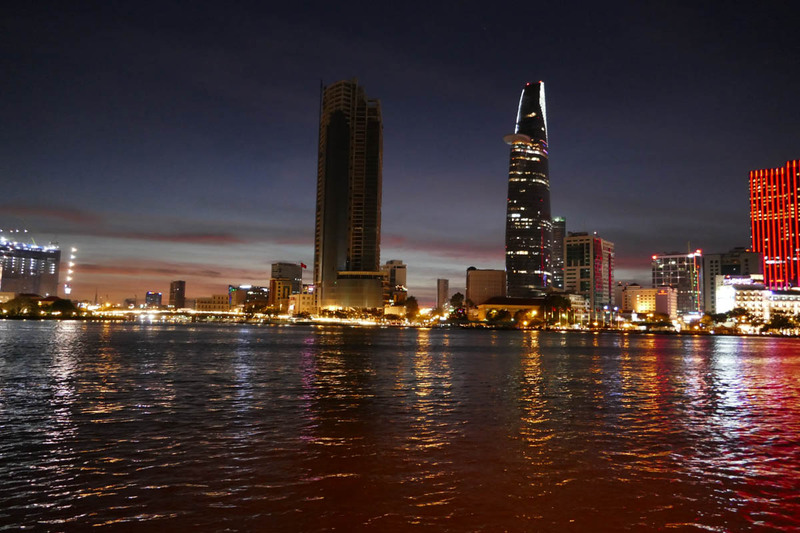 Ho Chi Minh City, popularly known as Saigon is a beautiful city, though at first, it will confound you. The traffic never stops, you take your life into your own hands as you cross the road, and then you find hidden gems of many colors. This may be a hole in the wall pho café; a wide tree-lined French influenced boulevard or a hotel that is very much avant-garde in its furnishings as is evidenced when you enter the foyer. Striking high back red chairs, a chandelier that looks like it is made of pearls, a café with a bakery to the side and some stunning artwork. You do wonder how the interior reconciles itself with the frenetic outside pace of Saigon, but this is why it works. 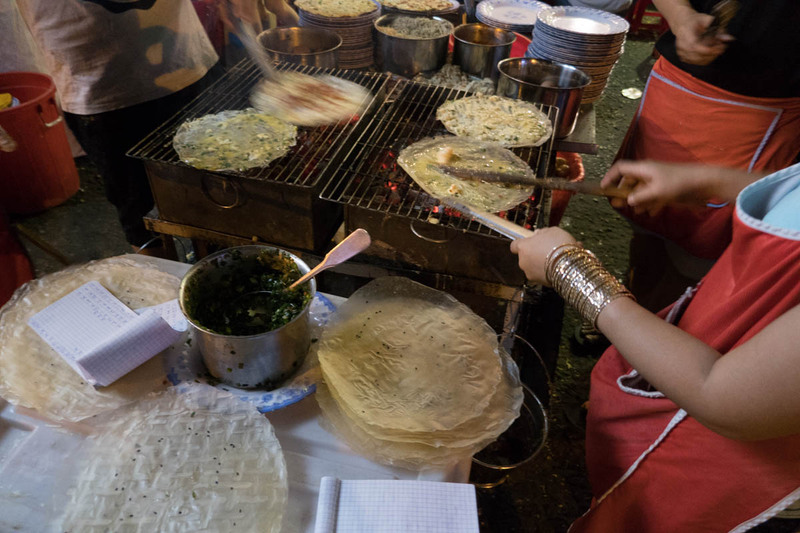 It does give you this break from the constant assault on your senses, that is Saigon’s endearing trademark. The hotel opened in 2015, and Le Meridien Saigon is located in District 1, along the Riverside area of downtown Ho Chi Minh City. 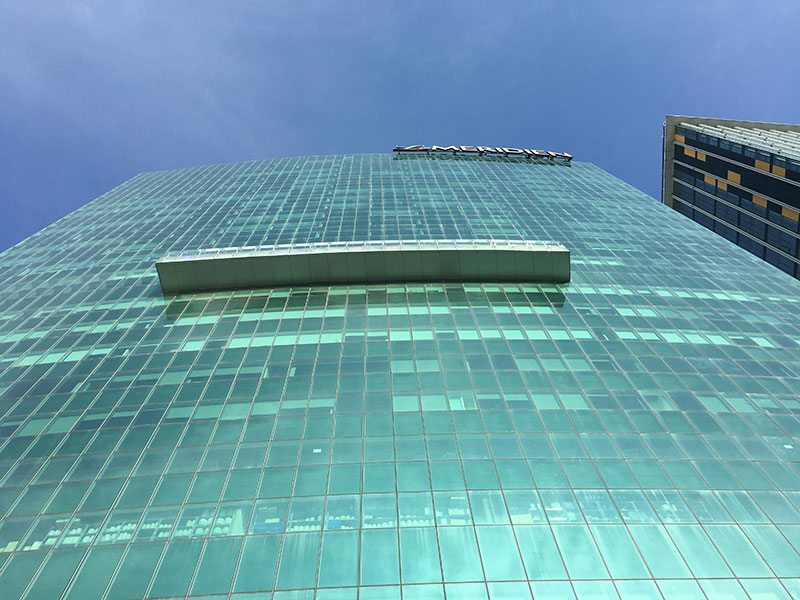 Le Meridien Saigon is 22 stories high, with 343 guest rooms and suites and an infinity-edge, saltwater pool on the 9th floor that overlooks the river and the ships being repaired. For latest prices staying at Le Meridien Saigon, check rates here. 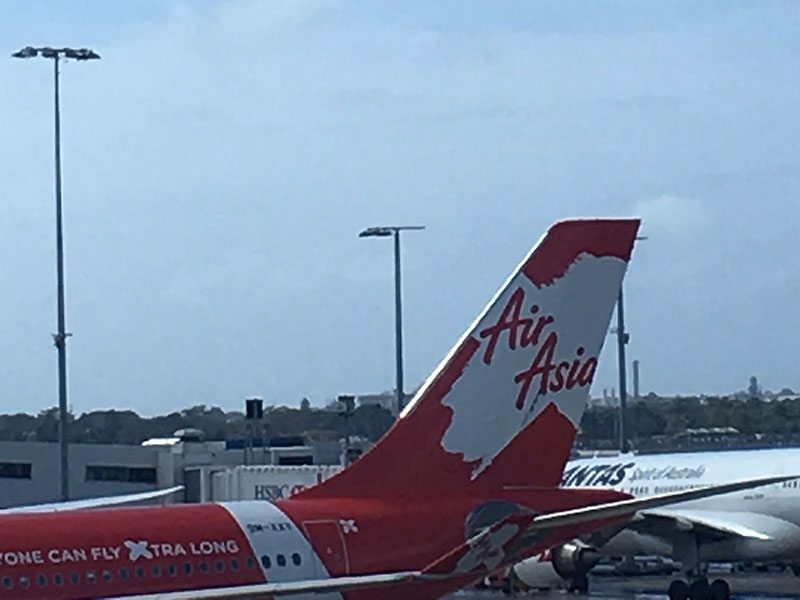 AirAsia has amazing deals to Vietnam, which to many Australians has become the new Bali. Offering a fly-thru service, people can transit through Kuala Lumpur the home base of AirAsia, straight to Vietnam or choose to have a couple of days in the capital city of Malaysia. The big advantage of flying AirAsia is that you have that much more dong to spend in Vietnam. You can read about our positive experiences travelling to Vietnam on AirAsia here. Le Meridien Saigon is located approximately 35 minutes from Tan Son Nhat International Airport (SGN). To get from Tan Son Nhat International Airport to the Le Meridien Saigon, you can hire a taxi or book a car service from the hotel at the cost of 1,600,000 VND about $70USD or $92AUD each way. We booked a taxi instead and paid 200,000VND or $8.77US, or $11.51AUD. Le Meridien Saigon has an amazing location and most of the tourist attractions are located within walking distance. 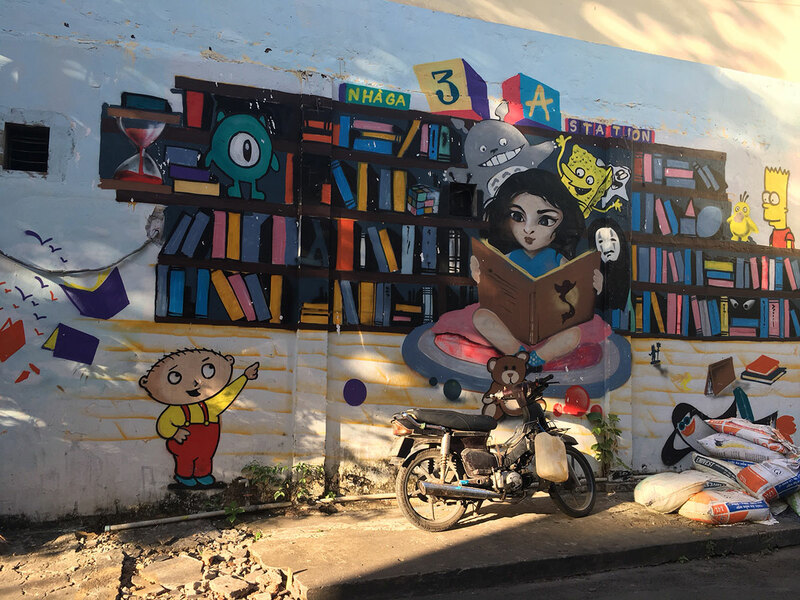 We chose, however, to explore Ho Chi Minh from the back of a motorbike, and you can read about that here. 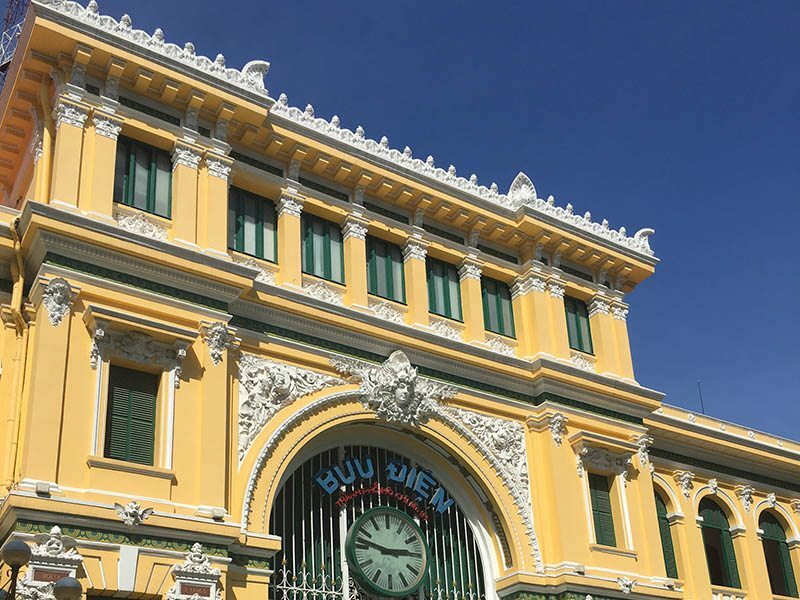 It is easy to walk to the Saigon Opera House, Notre Dame Cathedral, and the Saigon Central Post Office. The Reunification Palace and the War Remnants Museum are only 2kms away, and the walk is absorbing, as you watch life in Saigon on the streets. As you can see from our photos, the foyer is a statement piece. This continues into the elevator where neon lights dance away, and odd music plays at different times. 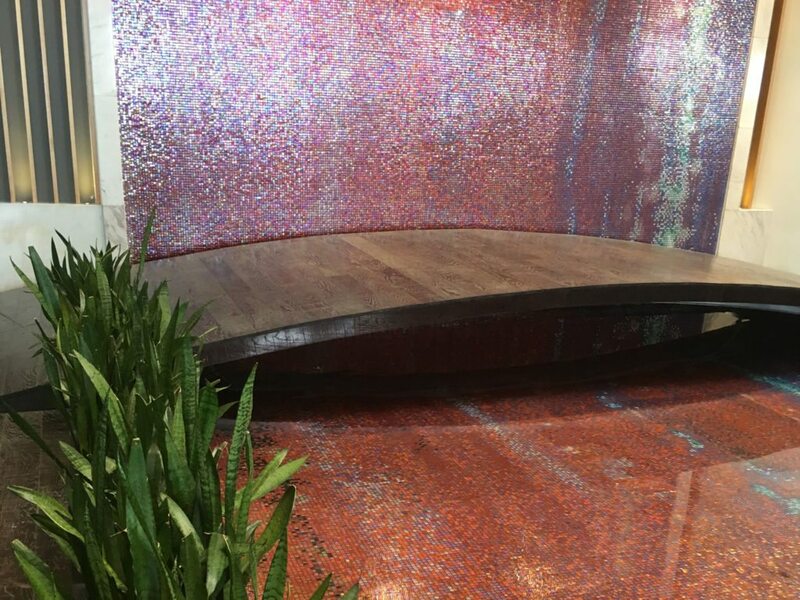 When you go to the 9th floor where the pool area is located, there are mosaics of colored tiles, water features and a bamboo structure over the bar area. It really is about art and design at the hotel. Next to the infinity pool is a state of the art gym, with a view over the working river, which is always intriguing to watch as you pound that treadmill. The art and design continued to our room with a bright red chaise lounge and some striking wallpaper. We had the Premier Classic Room for the two nights of our stay, and it was quite adequate. 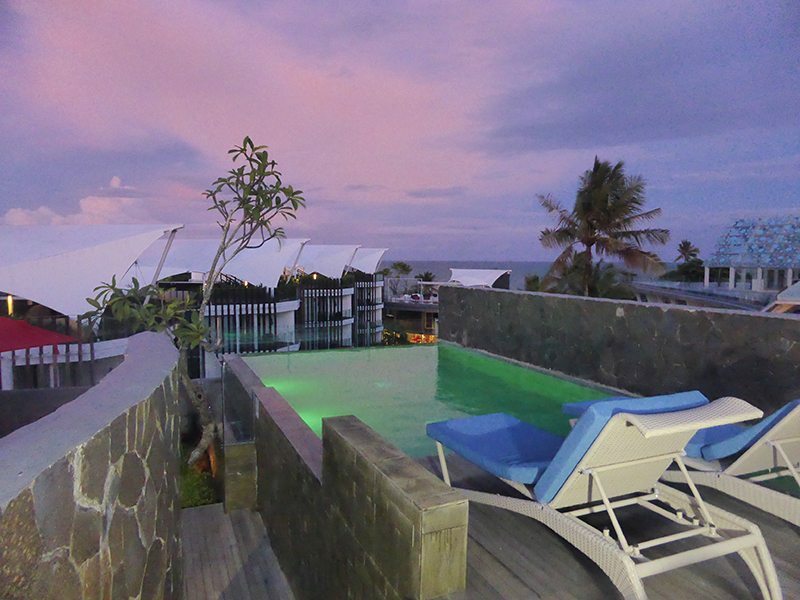 We have previously stayed and worked with Le Meridien Jimbaran Bay in Bali, but there we were spoilt with The Aqua Pool Sky Penthouse, which you can read about here. We dined at Bamboo Chic on our first evening. The art and design continued in this contemporary space feature modern velvet chairs with purple and plum pillows and dramatic beaded chandeliers inspired by the Saigon River. 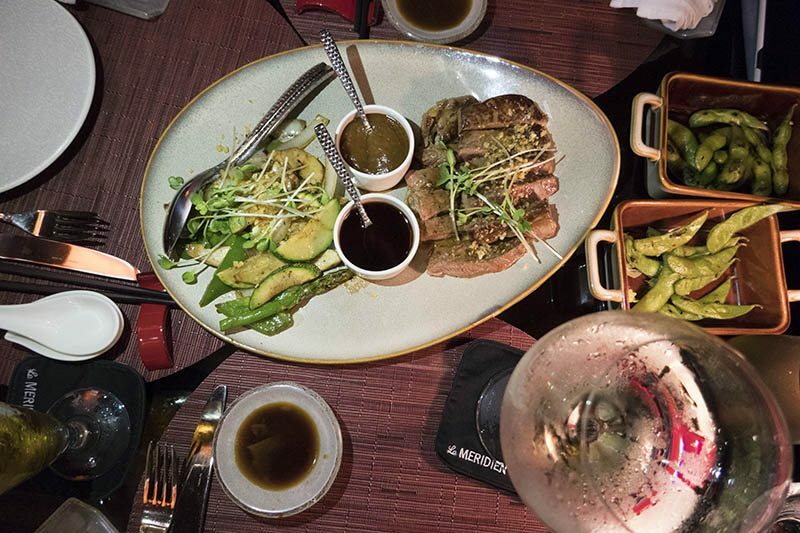 Bamboo Chic offers eclectic Japanese and Chinese dishes, and we were not disappointed. We had a very helpful waiter who helped us to choose our dishes by Chef Frederic Meynard. 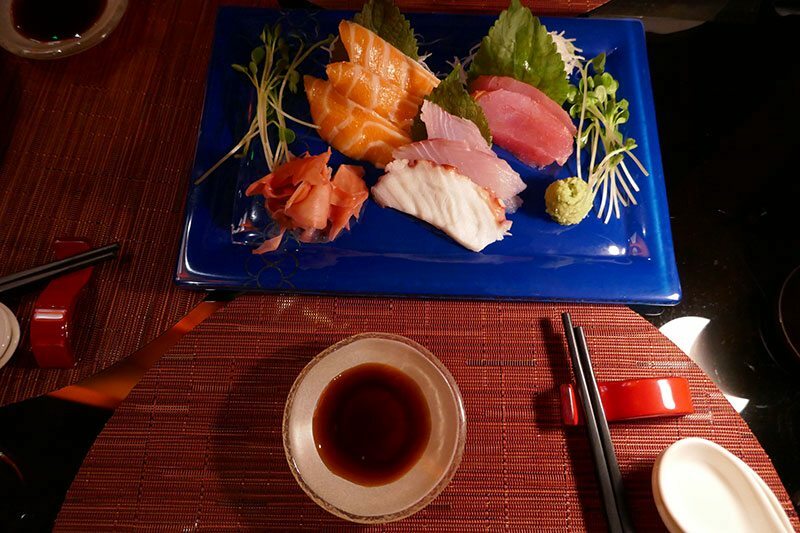 We started with sashimi with wasabi and soy, because I am addicted to sashimi. Wagyu Strip sirloin followed. Breakfast each morning was at the restaurant named Latest Recipe. I have not seen a better breakfast at any hotel. 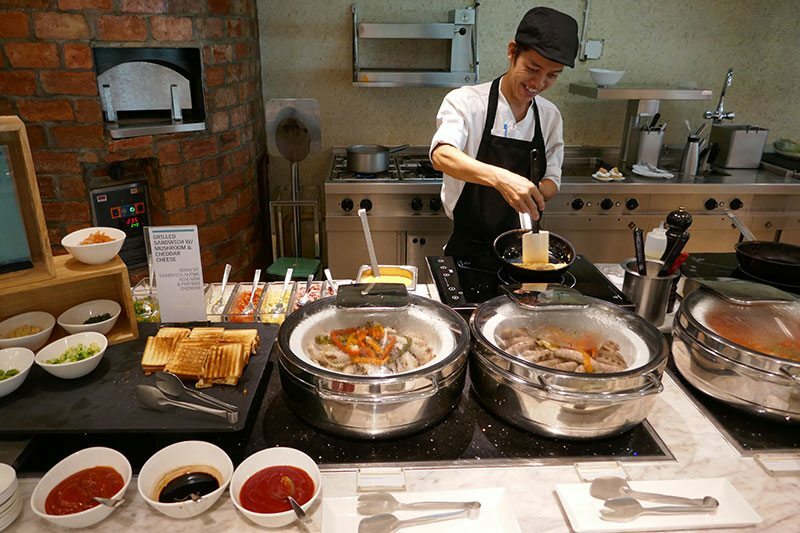 You have spoiled for choices from every cuisine from around the world. We liked the welcoming shots of juices each morning as we arrived. As a special note, it was Gordon’s birthday on our last day and a memorable one as we spent most of it waiting for a delayed flight to Hoi An. However, the staff at Le Meridien Saigon left a lovely birthday cake in the room for him the night before. 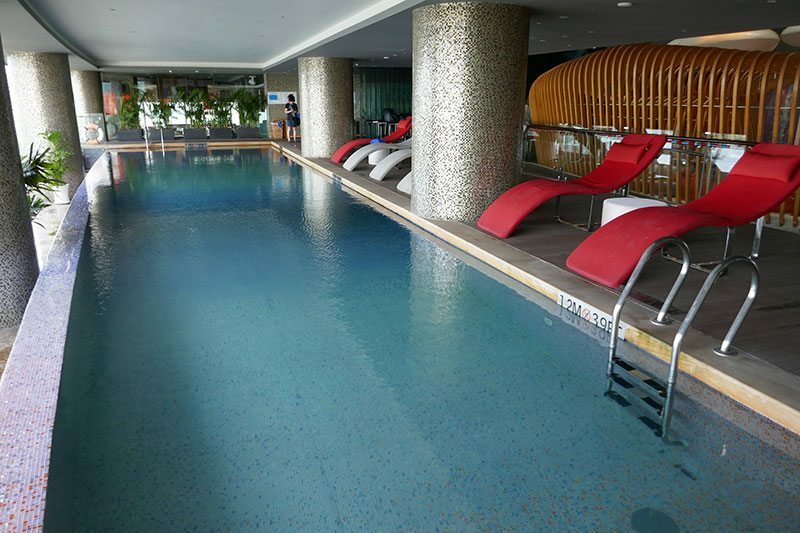 Le Meridien Saigon is a contrast to the hustle and the bustle of the streets. 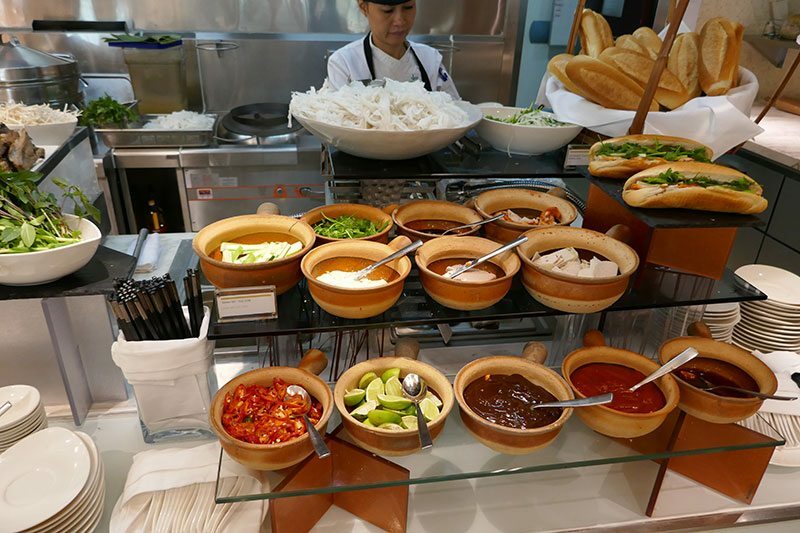 It offers a contrast from sitting on plastic stools eating street food to the exceptional international offerings. 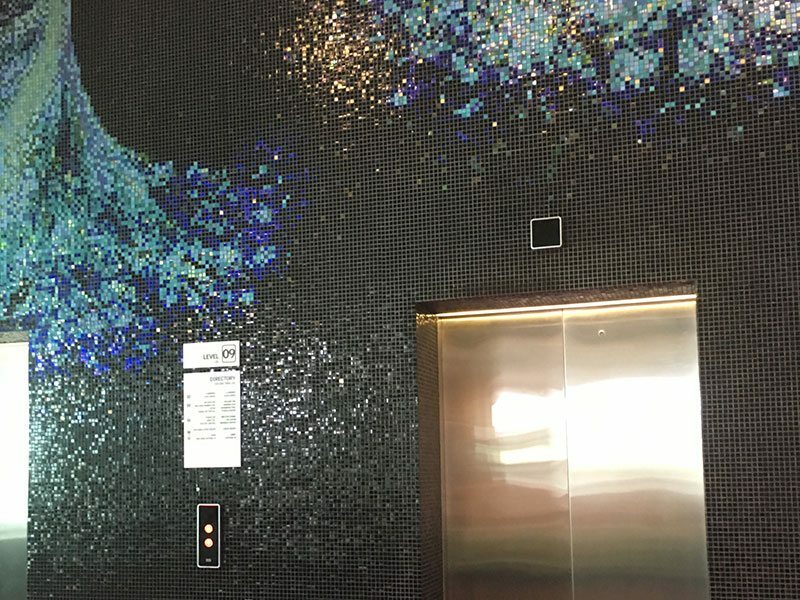 It is an avant-garde hotel in its art and design, and again the hotel sits next to a laneway of street art. It is a study in contrasts, and that is never a bad thing.